Did I miss the match thread ? Just catching up with the result at Taunton. Suffice to say the scorecard reads very nicely ! Good to see PT back in form, and especially Lewis G. (again). Shedding the burdens of contract negotiation seems have done him the world of good ! Great bowling figures from Max as well. Edited 2 time(s). Last edit at 02/08/2018 11:35 by Grockle. Excellent all round performance today.Gregory was immense. Superb fielding by everyone, and a wicket maiden by Max to open up with.Much more like the Somerset we know. Right on every count, Grizzzly. Great result and great individual performances. From the moment Hildreth was out we dominated the game. JH being out first ball is nothing to worry about, it happens even to the best of us, even to me once, well twice on the same day and on many other occasions. 3rd in the table and we might have been top if only the rain had fallen properly on Friday night. A comfortable enough win with some good performances. Excellent contributions from the bat by Pete Trego, Corey Anderson and Tom Abell, plus a superb all - round display from Lewis Gregory. A very good and opportunistic catch by Jamie Overton on the boundary, but his bowling did not meet expectations. We were on the ball and fielded very well. Only 7 more of these games left. Edited to say that James Hildreth received a very poor decision, IMO the ball clipping his thigh pad not his bat or the hand holding his bat. Edited 1 time(s). Last edit at 29/07/2018 20:50 by Tom Seymour. Great all round performance as Tom said. Trego Lewis Corey were brutal with the bat. Bowling then backed it up well. Jamie's catch was special, great to witness it live. 4 wins from 7 with still 4 of 7 left at Taunton, 4 more wins should see us through. I should know better than to start doubting Trego. Every time I do he comes back and proves me wrong. I didn't follow the match, but well done to LG, PT and others. I think Max Waller's contribution was very important. Keep doubting, Bobstan. It seems to work wonders. The target we set was formidable, especially as a wicket maiden first up put all the pressure on. I felt that the 3 doubtful umpiring decisions all went against us and we still dominated. it was a good win-especially as all the other games were rained off. Jamie's catch proves he has a brain. Thanks for posting a thread. Wanted to say we were ace today. Especially Gregory and Trego. They said do it. What was the attendance like today ? Difficult to get a true feel just from the on line clips, albeit I guess the weather may have caused some not to go. Another poor crowd but clearly weather was a big factor. The club reported this morning only 100 tickets left sonif true then several thousand decided not to travel. Plus the sky coverage would have given many an easy decision to not bother from further afield. I'd guess about 4500/5000 so 2/3s full optimistically. Officially the club quoted 7000,although there didn’t seem that many in the ground.Maybe that figure was tickets sold!!! Agree, a great performance, apart from the umpires and the technology. I have never before witnessed a referral to the third umpire, only to find the tv camera missing the stumps, instead inexplicably focussing on mid wicket. It looked like out, but the replays couldn’t prove it. No ‘snicko’ to overturn the not out ct behind decision, either. If we’re to have the cameras there I feel they need to do the whole package, as viewers come to expect this. The reason why there were not enough cameras to show the Eskinaki run-out was that the torrential over-night and early morning rain had caused the electrical wiring on some to short circuit. All three umpires knew this in advance, and should have told both captains beforehand that all yesterday`s decisions would be taken on field, with no referrals. As anyone sitting in the vicinity of square leg would have told him, Ian Gould must have seen Eskinaki was out by a goodly distance. Could have made a difference, as he was the only Middlesex bat to pass 50 and be there at the end. they had paid for access. They said on the morning that 100 seats were available for sale at the gate, so the advance ticket sales must have been well in advance of actual attendance. Club quoting less than 500 seats available for Wednesday match. A minimum of £27.50 per ticket seems a lot of money for a family, so the club has done vet well with the marketing. Would imagine there will only be roughly half the ground full come 4.30pm on wednesday , with people trickling in from work, assuming they can park anyway. I find it incredible that the ECB will not a match without floodlights start at 5.30pm at this time of year. It was the loudest rendition of Sweet Caroline I can remember hearing at the Cooper Associates County Ground. I think the entire crowd, or as near as makes no difference, must have been singing along. The decibels boomed out from the top of the Somerset Pavilion with, for a thrown together choir, a pretty good approximation of harmony. And still I could hear it soaring across the ground from the Somerset Stand and all around. By then Somerset were in the process of overwhelming Middlesex’s attempts to overhaul their gargantuan 229 for 6. Middlesex had won the toss, Gregory’s tenth loss in eleven, and put Somerset in because, according to Eoin Morgan, it would be difficult to know what target to set on the match pitch. Now, like so many sides this summer that have opted to field first, they found the actual target set was beyond their reach. Myburgh and Davies began, in front of a house which looked barely a third full, in their customary fashion. Davies targeted the long leg boundary with two high trajectory fours before being caught and bowled off a climbing top edge trying for another, the victim of a quicker ball. Myburgh drove and pulled a pair of lower trajectory fours, as is his style, before top edging a pull and being caught a few yards behind the stumps at the other end. “Here we go again,” said a dejected voice from the back of the stand. And it looked as if we might when Hildreth was promptly caught down the leg side by Simpson as he tried to glance. Three wickets in an over for Barber and Somerset had gone from 26 for 0 to 29 for 3 at the end of the third over. Trego added to the ring of inevitability which ‘here we go again’ had about it when, at first, he struggled to get effective bat on ball. Then, as if he had instantly invoked some all-conquering super power with which he had been imbued at the end of Weston pier, he sliced through the aura of dominance which Barber’s three wicket over had brought the bowler. 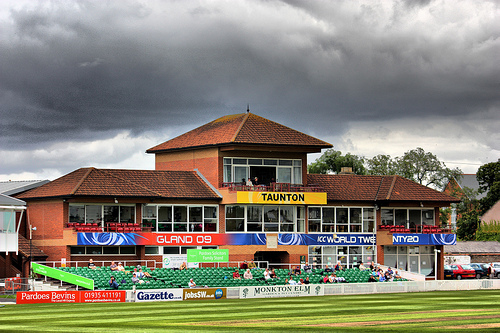 A piercing straight drive to the Somerset Pavilion was immediately followed by a disdainful pull behind square to the Temporary Stand where the old scoreboard had stood. Looking back through the lens of hindsight it seems as if the match turned on a sixpence in those two moments. Agar bowled the eighth over from the River End. Trego tore it, and Middlesex’s early advantage, to shreds. The first ball flew past the non-striker’s stumps to hit the Botham Stand boards. The second was driven into the Trescothick Stand without troubling the rope or the boards. The third was subjected to a fierce cross between a drive and a pull and this time slammed into the Trescothick Stand boards. Middlesex posted a straight long on, a long on and a deep mid wicket. Having driven the fourth ball neatly towards the gap between two of them and taken two, with the fifth Trego rendered all three redundant by depositing the ball over the Trecothick Stand and into the river. A final drive towards the Botham Stand was sufficiently wide of the boundary fielder for the batsmen to run two. Trego had taken 24 off the over and Somerset, 85 for 3 off eight overs, had assumed control of the match. The crowd, after the shock of 29 for 3, had by now found its voice; and its seats, for the ground looked to be around two thirds full. Trego’s assault on Agar brought them to life as applause turned to cheers and cheers to roars as the over progressed. The furry heads in the Ondaatje Stand blew in the breeze as they cheered, clapped and waved their ‘4’/‘6’ cards in the air. The top tier of the Somerset Pavilion erupted around me. 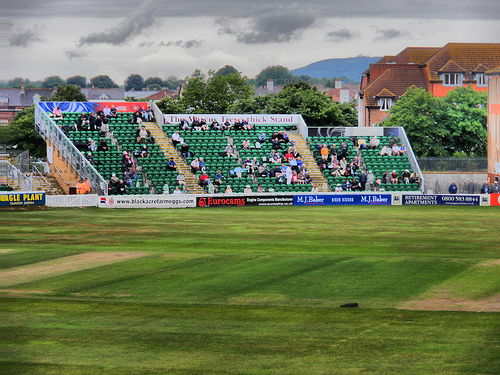 Trego had ignited the Somerset support. 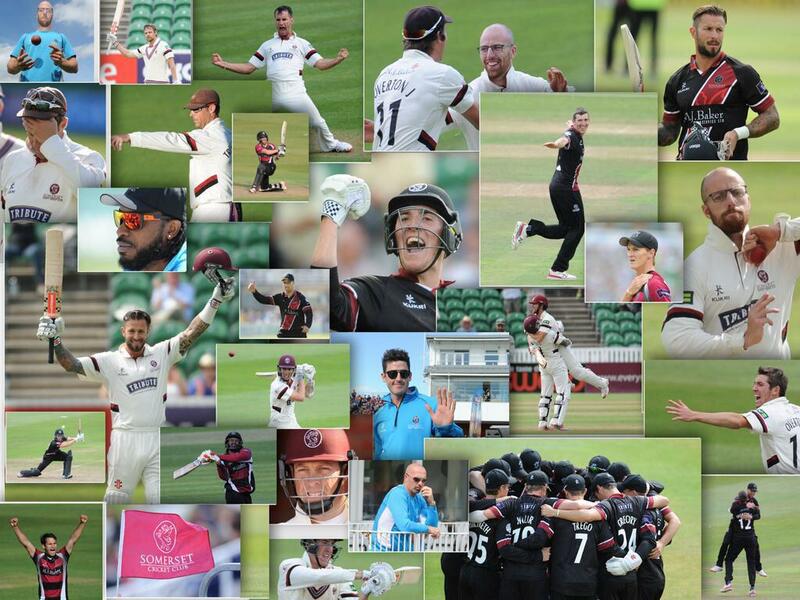 It stayed ignited for the rest of the match for in this game Somerset, after Agar’s over, never let up. 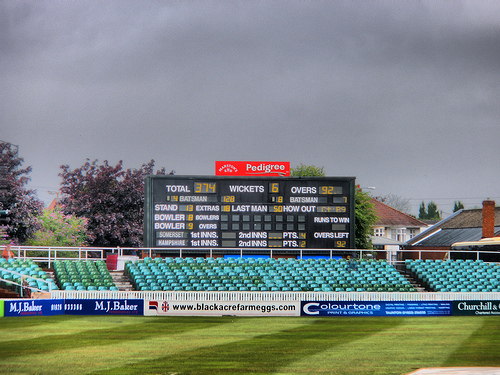 Trego drove Patel into the top tier of the Botham Stand. It would have gone in the river in the days of the man himself. Then having late cut the returning Agar for four he top edged a pull and was gone for 60 from 31 balls scored in a stand of 83 in seven and a half overs with Abell. For Somerset, now 112 for 4 in the 11th over, Trego had wrought a miracle. He held his bat aloft as he was applauded from pitch to perimeter, most standing to see him off the field. The ground was abuzz and as he crossed the line and as the applause died you could sense people wanting a moment to digest the innings and the turnaround in the match they had just witnessed. T20 does not allow time for such reflection. 60 seconds from the fall of a wicket and the new batsman has to be at the crease so Anderson, employed by Somerset to exploit exactly this sort of position, was already half way there. He joined Abell who, whilst Trego had been cutting swathes with the broadsword, had been working his way forward with the rapier. To keep the strike rotating in Trego’s direction he drove classically into the covers for singles. When the ball was right for it he put more power into the stroke and lifted it over extra cover for four. Now at every opportunity Abell stroked the strike to Anderson and Anderson drove the score forward. He drove Patel for six just out of reach of the fielder guarding the Colin Atkinson Pavilion and, next ball, lifted him into the Temporary Stand just in front of square. Abell swept Agar for four to the Temporary Stand before being caught just short of the Colin Atkinson boundary. Abell, and it took two looks at the scoreboard to register this, had scored 31 from 21 balls. He had left the impression of scoring perhaps half that. 138 for 5 in the 13th over. As Gregory hustled to the wicket people were trying to work out which Somerset batsmen still had to bat. There were enough runs on the board for the 13th over but were there enough wickets left? Heads turned and voices mumbled, mentally trying to conjure 70 runs from the rest of the order. Anderson did not immediately still the mumbles as he struggled to come to terms with Barber. Then Gregory launched Agar for a huge six which must have ended up in the St James Street car park. That quelled the mumbles, the crowd started cheering and applauding, the ‘4’/‘6’ cards started waving and people were talking animatedly to one another. That stroke heralded a clean hitting innings of extraordinary ferocity and ever more enthusiastic chords of Sweet Caroline which had never sounded sweeter. Fuller, restrictive earlier on, was driven for sixes by Gregory and Anderson as the Somerset storm started to rage. Barber, he of the three wickets in an over, was driven, hooked and driven again for three fours in succession by Gregory. In the next over Gregory calmly despatched Harris four times in succession to the boundary. Then Fuller was pulled high to the Caddick Pavilion for six and classically driven through the covers for four. Whoever coined the phrase ‘whirlwind innings’ must have coined it for an innings such as this. Gregory’s 50 came off 21 balls. Trego had put Somerset in charge of the match. Gregory effectively took it away from Middlesex. The crowd was by now floating, cheering and singing on air. The Family and Alcohol-Free Stands were pulsating. It felt like the whole of Somerset was rocking. Two thirds of a crowd making up for the other third. “Gentlemen in England now abed…” sprang to mind. In the final over Gregory pulled Harris in front of square for six into the Somerset Stand before top edging him into the hands of Patel. 62 off 26 balls and Somerset finished on 229 for 6. Anderson had struck his own sixes too but had balanced that perfectly with keeping Gregory on strike. He balanced well enough to score 41 not out off 24 balls. As the crowd applauded the players off the field a buzz of anticipation around the ground filled the air. The anticipation was soon palpable and building as Waller opened the Middlesex innings with three dot balls. The cheer that greeted Abell’s catch at cover off the fourth to dismiss the penned-up Holden was one of expectation rather than hope fulfilled. That the over ended in a wicket maiden seemed to surprise no-one for Middlesex had looked stunned at the end of the Somerset innings. The scale of the task facing them was illustrated by the required run rate starting at 11.5 and rising to 12.1 in the course of that one maiden over. For two overs Gubbins and Stirling held to that run rate as they attacked Taylor and Overton, striking five boundaries. You sensed though it would not last because the Somerset fielding was explosive, Myburg stopping one lightning fast cut from Stirling with a lightning fast dive, and Taylor had induced him to edge over the keeper’s head. Just as Gregory had broken the back of the Middlesex bowling after Trego had batted Somerset back into the match so he broke the back of their batting. Gubbins stepped away towards square leg as if to hit through the offside, Gregory aimed at the base of the stumps, Gubbins tried to bring the bat down on the horizontal as if he were closing a garage door, but too late. The ball was through and the wicket broken. 29 for 2. Morgan pulled Gregory only to top edge a comfortable catch to Taylor. 45 for 3. Only the beginning of the fifth over but the required rate and the volume of expectant Somerset cheering were both rising. And then something truly exceptional, although the word is hardly adequate to the task I have assigned it. Overton’s catch to dismiss Stirling. Stirling, as he usually does if he stays at the wicket, was just threatening to at least make an attempt on the Somerset total. 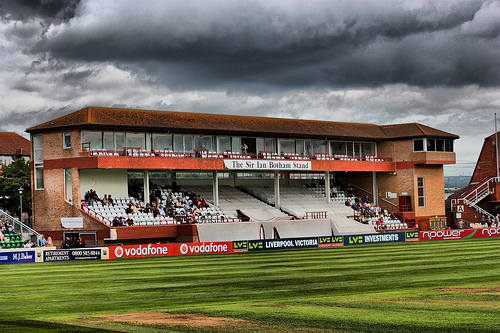 He drove van de Merwe high towards the Trescothick Stand. Overton backed close to the Trescothick Stand rope, jumped high with arms aloft and took the ball at full stretch, the momentum drove him backwards, he landed one foot inside the rope still going backwards, flicked the ball high in the air and slightly forward as he hopped over the rope, landed, hopped back into play and caught the ball as it came down. He did it with such control it looked easy. Do not try it at home. It was the best controlled catch of its type I think I have ever seen. 50 for 4 in the seventh over, the required rate rising to 13 and the decibels with it. A flurry from Eskinazi and the inevitable Simpson followed. Sometimes they got near the required rate against Taylor and Overton but against Waller and van de Merwe they were squeezed unmercifully, and as they were so the required rate rose inexorably. A two over reduction for rain made left Middlesex needing 125 runs off 47 balls. The man in front of me turned around and said, “Too many.” It was all that needed to be said. The tension gradually seeped away and the noise of the crowd, wickets apart, became more muted as does the force of the sea after a great storm. By the time Simpson skied a monumental steepler off Gregory the required rate had passed 17 and was still rising. The ball rose for some considerable time and then took some more time to come back down. All the while Overton stood under it hands at the ready, head rock still, eyes sharp focused, hawk like, on the ball, hands adjusting marginally, breath held tight in the crowd; and then the ball dropped straight in as comfortably as a snooker ball might drop into a pocket. Huge cheers. Don’t try that at home either. 115 for 5. 98 still needed. 33 balls left. Eskinazi fought on but in truth that catch was effectively the end of Middlesex’s faint remaining hopes. He was finally out to that classic failed run chase dismissal, caught at deep mid wicket, for 55 from 32 balls. Van de Merwe the catcher, Gregory, in this match, the inevitable bowler. He had taken a wicket in each of his four overs and ended with figures of 4-0-28-4. His bowling looked right too. Middlesex ended on 174 for 6. 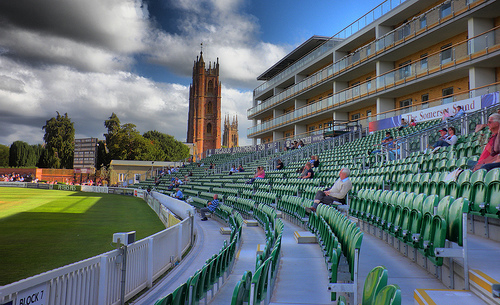 Somerset had won by 38 runs using the DLS method and the two thirds of a crowd that had cheered like a full house left the ground on a wave of smiles and animated chatter, doubtless unable to get Sweet Caroline out of their heads. It had been quite some performance after Friday’s debacle at the Oval. ‘Get straight back on your horse’ they say if you fall off. Somerset had done that and driven a coach and four through Middlesex as Surrey had through them. And just a thought on captains and tosses. This had been the 23rd time in this competition this season that a captain had won the toss, inserted the opposition and lost; against the 16 occasions on which they had won. Odds of almost 60/40 against insertion. It was also the 31st time the side batting first had won against the 24 on which the side batting second has won. Odds of about 55/45 in favour of batting first. And yet in two thirds of cases captains who win the toss insert the opposition. Neither set of odds is a reason of themselves for batting first but perhaps they should be a factor taken into account. I wonder if counties look at the percentages on toss decisions. If they do not perhaps they should. By the way did anybody hear the conversation between Marcus and Mike Atherton during the rain interruption? he has some very odd ideas regarding county cricket. He seems to be suggesting playing county cricket at the same time as this new Game in 2020, (can't call it cricket). Marcus said a high number of players will not be available while this new game is being played and suggest it will devalue county cricket, Mike Atherton said it would give a chance for the youngsters to play. I wish there was a separate recording of it somewhere so everybody can hear what he said, he seems to be in the same box as Graves! Edited 1 time(s). Last edit at 31/07/2018 11:21 by Mike TA1. Mike, presumably you're saying that it's Vaughan who has odd views, not Marcus? I do t think it's a great shock that MV has similar views to Graves, they are peas from similar pods. I didn't make it very clear, it was MA with the odd ideas not Marcus. Marcus didn't seem to like what he was saying. Edited 1 time(s). Last edit at 31/07/2018 11:22 by Mike TA1. I confess to recall seeing Marcus talking to Mike Atherton, but not Michael Vaughan. Thanks Tom, I will edit. Edited 1 time(s). Last edit at 31/07/2018 11:24 by Mike TA1. There is an opportunity already available for younger players not yet quite ready for the Championship.... It is called the second eleven. If you want to put the second eleven players in the Championship then call it the second eleven championship and charge people who are going to see it appropriately. Don't pretend it is entirely Premier Championship cricket and ask people for up to 20 quid a day for it! Playing CC1 cricket in the summer would be an interesting concept though. George Dobell is pointing out that ticket sales for the India Tests are not going wonderfully well. Maybe that is because cricket in mid to late September is a weather lottery and an event that will give you little change from 100 quid per person for the day may bot be all that enticing in the autumnal chill between the sun and rain showers. I think that a combination of high prices and the fact that India have, in recent times, often been shocking in Tests in England are the main factors, rather than weather. To be honest, September's weather is often better than August's. Of course, Indian fans that are resident in the UK may, these days, only be interested in hit and giggle, in a great many cases.